1. I ordered my triathlon suit today. After much back and forth, I went with a one piece. It should be here by April 30, which will give me plenty of time to practice all of the sports before the event. I was in between sizes and went with the smaller of the two, so I'm crossing my fingers that it fits. I'll be giving a full review once it arrives and I've given it a few test go arounds. 2. I won a prize in the Jelly Bean Virtual Race! 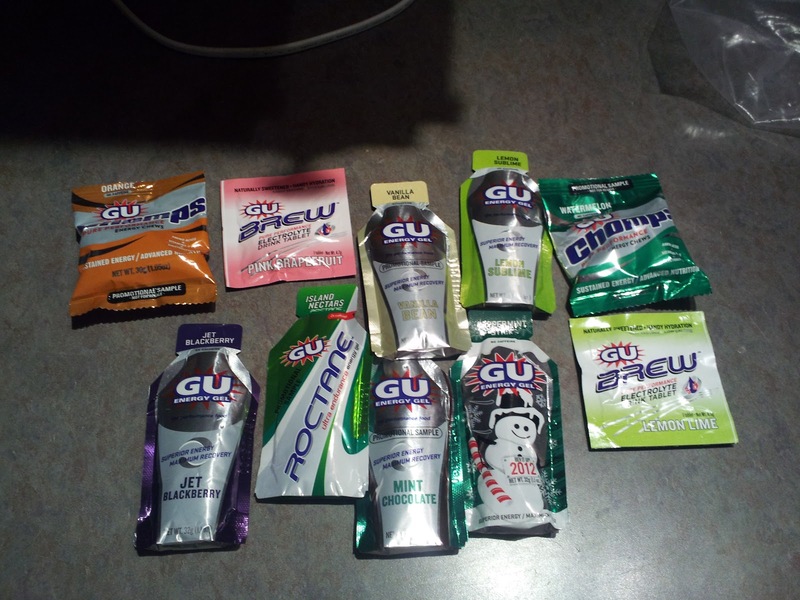 I won an assortment of Gu products, including gel, chomps and brew. 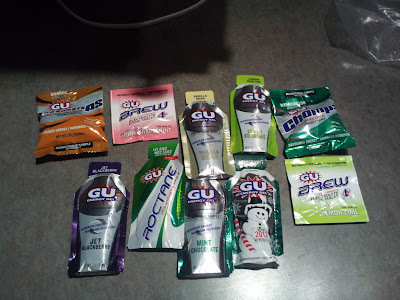 It's all flavors I haven't tried, so I should be well-stocked for a while. 3. 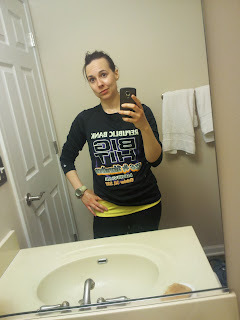 I did an interval workout tonight that totally sucked. My first .25-mile interval was at a 6:15 pace (waaay too fast). As a result, my seventh .25-mile interval was at a 8:09 pace. Bad, bad Kelly. Also, I was a hot mess at the end of that thing. They say that if you look cute at the end of a workout, you did it wrong. I prove that it doesn't mean you did it right, either. 4. I've had a snacky day. I can't help it, I'm really damn hungry. 5. My sister and I are going on a ghost tour tomorrow. I can't wait to pretend to be Zac Bagans. Except I'm a better actor than him, simply by having facial expressions. Oooh, ghost tour! I love those things. Where are you touring? Are you doing the Living Social one? We had to cancel ours because I was sick, so I can't wait to hear all about it on Sunday! Yep, it's the Living Social deal that's in Chicago. Hopefully we spend a lot of time on the bus, because the weather is looking very ominous. Good luck with the tri suit. I've never had a suit but certain brands of tops run small. That being said, I'm a "big" girl so it's probably more of an issue for me than it will be for you. As you do intervals more you will get better at not going out too fast! I think that is actually really hard. You feel so good when you start! Uh-oh, now I'm worried the suit will show up looking like it would fit my tiny dog. I guess only time will tell.